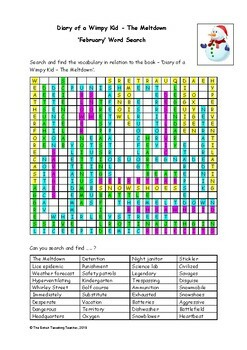 This is a word search which features key vocabulary around the theme of the book 'Diary of a Wimpy Kid - The Meltdown'. It focuses on the vocabulary used in the book's second section: February. Its aim is to raise students' interest and familiarity of the vocabulary used in this new publication (October 2018). It is suitable for elementary, middle school and home school students as an activity to supplement their general knowledge of this series of popular storybooks. 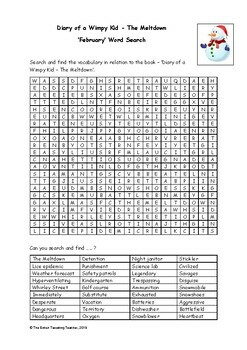 This word search is part of the series of resources produced for the 'Diary of a Wimpy Kid - The Meltdown' published by the 'British Travelling Teacher'.